Boy, you are making my mouth water. It will be ages before I can even start my tomato seeds inside. Have you ever considered making your own solar dehydrator? Inexpensive, saves on the power bill. It is really easy. There are directions on the internet for the non-handy person. I live in the US, but on the north side of a hill, so its like living in a damp, dark cave. My sun-dried tomatoes end up being semi-shriveled moldy things. We have a Brigadoon garden…lost in the morning fog. I had oven-dried tomatoes at a cocktail party this weekend and they were delicious. A great addition to the appetizers. I’ve toyed with making a solar dehydrator too, Nancy, but think it may be too humid at my place for it… I live on the Delaware River. Maybe in the middle of summer? I’ve often thought about making these myself. I guess you store them in oil afterwards? Or do they not last that long?! Robin- here, I live down stream from a waterfall. So middle of the summer it is. Thought a good design should resolve the humidity problem. You may need to add a little fan, but most designs work on the chimney effect so you should be okay. If you completely dry them the will last…like the winter. Especially if you vacuum seal them. Of course they aren’t as much fun REALLY dried so..
olive oil, basil, rosemary, pepper flake. Put on the lid and let marinate for no less than a week in your refrigerator. I make them just before Xmas and label them as a salad topper. People beg for more, I even got one friend to do my dishes for another jar. Another offered to pay. Heehee. My evil plan: I’m going to take over the universe with marinated sun-blush tomatoes. Neighbour Nancy – Hello! I’ve just been Googling solar dehydrators and thinking of all the things I could dry… Blueberries are appealing to me in particular. Cheers for answering Helen’s question on preserving as I wasn’t sure at all. These are so simple to make I have just been making as much as I need/want and using them all up. Honestly, I have no friggin’ idea how long they last in the marinated frig method. At least, a month I think I once read, but I always share mine so I have no clue. Oh, and in the end, after all my solar dehydrator research… I ran out of time and bought an American harvestor?, I think. No worries about dampness. Fantastic for drying windowsill herbs. http://www.4phg.com for the plug in kind. Of course the danger is that you dry everything that doesn’t move and end up making jerky and fruit roll-ups. They really are a cook’s toy. I play with mine a LOT as I harvest. Do your research and I wouldn’t pay over $35 US for it. Sorry Wendy I don’t know what the hell that would be for you, love. Oh I love these! Have you ever tried a topping of olive oil, lemon juice, sea salt and fresh chopped rosemary? Nummy. Yours look great as well! When tomatoes are back in season [MONTHS from now… sigh…], I’ll definitely give these a whirl! oohhhh! These look wonderful! 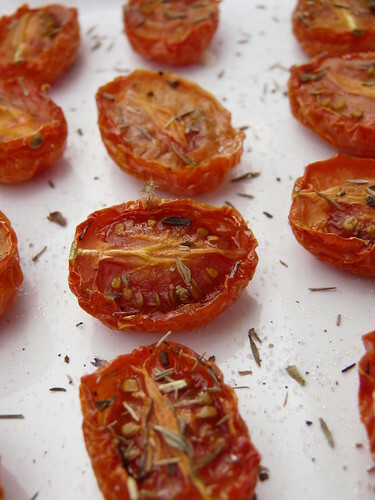 I have been meaning to try oven dried tomatoes for a while now, but until this post, all the recipes I have seen say to leave them in the oven overnight. The idea of leaving my oven on over night freaks me out a bit–plus, anything that takes longer than 2 hours to make always makes me think that it is a huge commitment, even if it is just sitting in the oven. But two hours I can do! If I make a big batch, do you think that I can just keep them in the refrigerator for a while, or do I have to cover them with oil? I have an embarrassment of fresh little tomatoes straight off the bush right now, ready to be halved and dried in the oven…. I actually do like sun, or oven, dried tomatoes which rather goes against the flow these days. But my favourite home dried fruit is strawberries – halved and slowly dried in a low oven. They are fantastic in muesli. See, you have to dry them in a dehydrator, so that they get really really dried. Then you can cut them up with scissors, if you’ve placed them face down, and then you have lovely tomato-strips! Or, if you placed them face up, you have little wizened things which resemble raisins – particularly wonderful with the Sungold, cherry tomatoes. Yum! We vacuum-sealed them using home-canning jars, and they keep indefinitely. You just have to make sure they’re really sealed. Or just tuck them into the deep-freeze. I never know if it’s the cheap oil and dusty, woody herbs they are preserved in or the leathery can’t-quite-chew-them-properly texture. Either way, bleurgh is the word. Lovely touch of sunshine for your wintery northern kitchen. l’ve a big bowl full of cherry toms fresh from my vines. Wish I’d grown more this year. Next time. I’m sorry it took me so long to get back to you guys. Between the maple sap really flowing for the first time today, getting my soft fruit order in and my hellishly LONG post on canning… I’m shot. And I blame it on you guys. I was stuck for a topic and along comes Wendy and her tomatoes. Wendy- I just bought 12 more blueberry bushes, come on over. Em- Isn’t there something just magical about big stack jars all neatly displaying their contents? There’s a smugness to canning. You think, this is ALL MINE! Nancy – That’s about £22 for us. And if you see some tall girl in amongst your blueberry bushes – that’ll be me. PS Are you a blogger? You haven’t linked to your site. Heather – Shall definitely try that one out. I use that exact mixture with peppers sometimes. Pia – I didn’t used to be either but I love them all these days. Apart from the nasty watery winter salad tomatoes. It’s tinned or baby in the dark months only! AOF – Dried strawberries, you say? I’ve only had the sugary ones and they just taste like sugar. Will look out for these. Em – You have a point. Perhaps I’ve just had crap sundried tomatoes… Hoping there are some Italian neighbours in my next house! Lucy – There is some kind of odd bitter after-taste that I just hate. Can’t do them. Just can’t. Your oven dired tomatoes sounds so good!!! MMMMM… Thanks! I am never very sure, if I should link it, as I am not to sure about blog etiquette. It’s a (hopefully) informative, sometimes humorous blog. I write stuff for apartment gardeners, beginner’s, cooks, people interested in growing or raising their own food but don’t know where to start. Kitchen beauty recipes and getting by on less. Oh, and a very naughty rooster and why he no longer lives here. Come on over feel free to argue, comment, criticize. 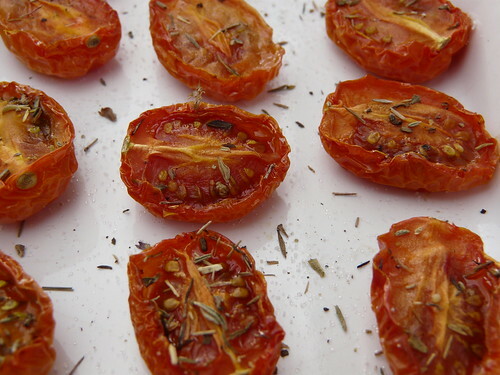 I do oven roasted tomatoes with romas or small on the vine tomatoes. I don’t add sugar, though. Simply cut them in half, spray lightly with olive oil, a good grind of salt and pepper on each (sometimes some chopped herbs too), then into the oven for hours and hours. I’ve never been a big fan either, but the oven roasted – much better. I loved the photos of the snow puppies! Batch one completed http://confessionsofafoodnazi.blogspot.com/2009/02/semi-dried-tommy-toes.html – packed in olive oil studded with garlic! Nancy – Thanks! Shall check it out. 🙂 By the way, there should be an option when you leave a comment to put your URL into the comments form. That way when people click on your name they are directed to your page. Katie – They were funny! AOF – Off to see them now!